In March 2016, Collins - then on loan at Northampton from Shrewsbury - was banned from all British racecourses, along with MK Dons midfielder Samir Carruthers, after being photographed apparently urinating on a balcony at Cheltenham Festival. He said: "I have grown up a lot over the last few years. Obviously, like everyone else, I have made mistakes along the way and learned from them and matured into a man, really. "I've got a young family now, which always helps, and you have to grow up because it's not just me that I'm supporting now, I've got a family to support as well, so you can't really afford to slip up anymore. "I definitely think that's helped me on and off the pitch." Collins' 20 goals this season have helped promoted Luton to establish a five-point lead at the top of the table and caught new Ireland boss Mick McCarthy's eye at a time in his career when the former Republic youth international feared his chance had gone. He said: "The calibre of strikers that Ireland have had over the years, I always knew you maybe had to be Championship and above. "I've had to work my way up from the bottom and I'm really fortunate that the gaffer has given me a chance this year of being in League One." He said: "I went on trial at Sheffield United and I think that's what I needed. It was like a kick up the backside to show me where I was and proved why I hadn't been selected for my country. "My form hasn't been good enough. Now I have got the oomph back and I am enjoying playing my football again." 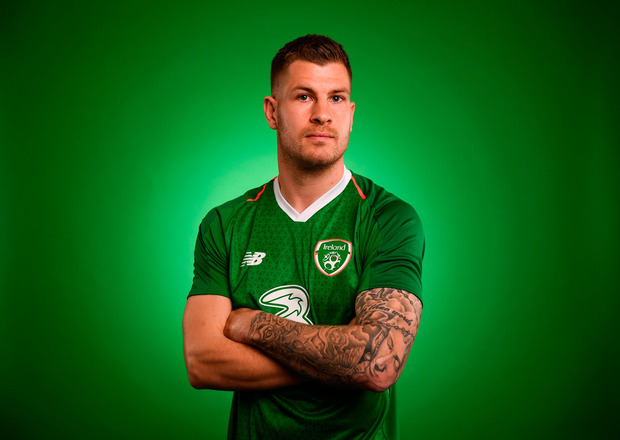 McGoldrick's absence from the Ireland squad during the latter days of Martin O'Neill's tenure sparked rumours of a fall-out between the two, but the striker was quick to play down the suggestion. He said: "Every player wants to play and I'm no different. I wasn't happy that I wasn't playing but there was no fall-out."